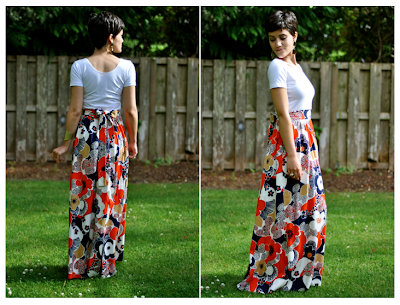 I'm in love with the current maxi skirt trend, but more specifically taking it to another level of boldness. As opposed to what I hear some people say: "a longer skirt should be more subtle in fabric color and pattern," I say if you've got that much fabric to work with, make it amazing. Basically you have a bigger canvas to show off some madness! As of late I have been finding some beautiful maxi skirts for my shop. I am absolutely in love with the psychedelic 1960's prints, 1980's color-block madness, simple polka dots, and geometric patterns. They truly are a fashion statement. 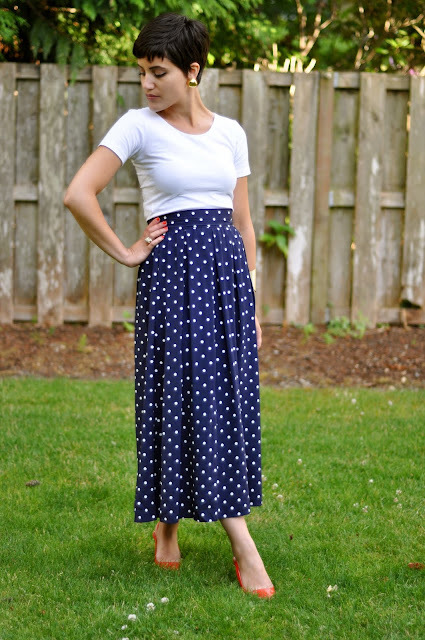 Some of you will get perplexed when it comes to pairing an outfit around a longer skirt. Lately I have been super into the fitted cropped t-shirts sold at American Apparel (I got a couple the other day, and they have a 15% off deal if you buy 3 of the same items.) If you have a longer torso the t-shirt will be more cropped looking and that little bit of skin showing between the high waist maxi skirt and the fitted top is a fun, beach-y look. 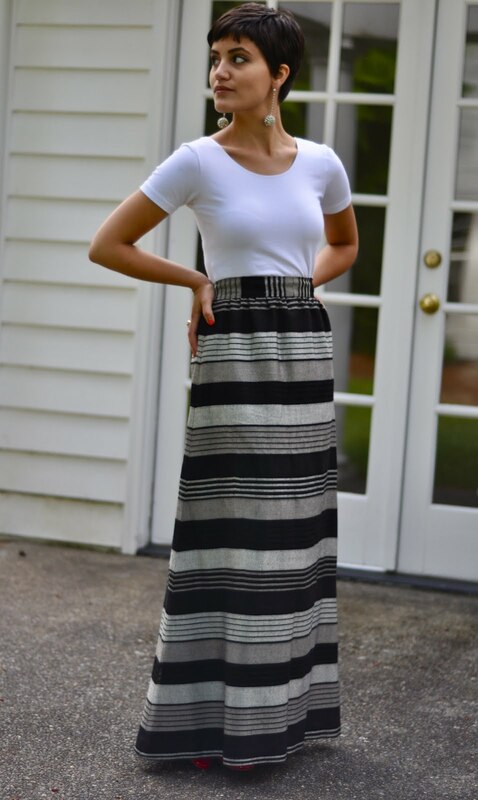 Pair the flowing long skirts with a fitted top and then go all out with some dramatic accessories. Think huge earrings or a bold statement necklace. If you're the bracelet type, wear a pile of huge, mismatched bracelets. 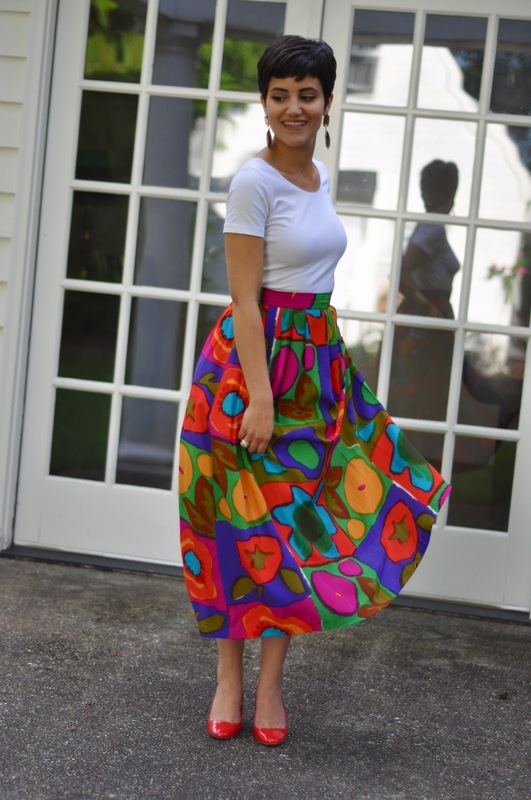 Go ahead and find them in bold colors that contrast your skirt. For example, if you're wearing a turquoise maxi, find a bundle of orange and peach toned bracelets with super busy prints. 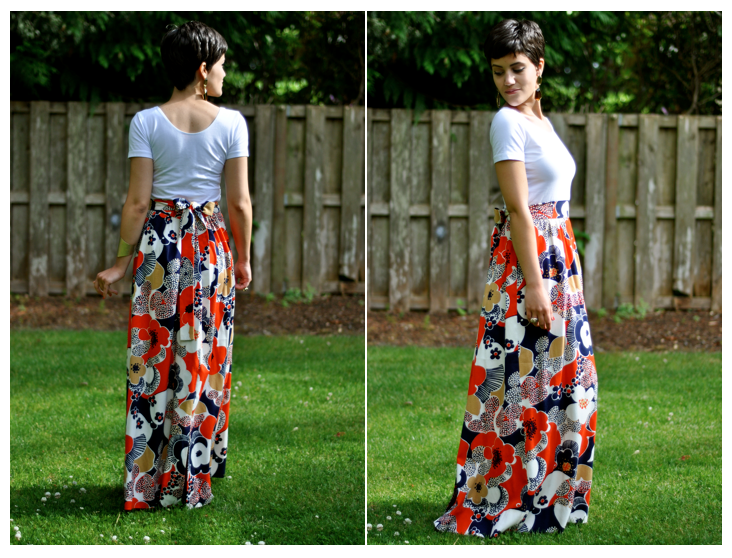 If you're wearing a bold floral printed maxi, go for equally as bold bracelets in a striped or geometric pattern. Opposing patterns, opposing colors whatever works, just go wild! Ok the maxi dress with the flowers.. i ust have to know where you got it from? ?